Ohuhu 3D Padded Cycling underwear This underwear is perfect for bicycle activities. Mesh breathable design makes it comfortable. And the 3D padded design can relax hip muscles. Soft Foam and Gel Padding Unique Silica GEL cycling pad to absorb shock, providing miles and miles of comfort. 2.9cm/1.14inch pad (compare to 2.5cm/0.9inch pads of many cycling shorts in the market), for extra comfort and cushioning. 3D Padding for Full Protection 3D Padding is male-specific, designed not to chafe in key areas. Designed with ultra-durable, premium, stitched 3D padding that won't slip or slide for excellent resistance and comfort when used with hard, uncomfortable bicycle seats! Breathable Elastic Polyester/Spandex Breathable material provides super flexibility and keeps your body dry. High elasticity provides extra comfort. Reasons to wear padded cycling shorts Increase comfort on longer rides by reducing chafing and providing shock-absorbing padding Reduce wind resistance, increasing aerodynamic efficiency; Protect the skin against the repetitive friction of the legs against the bicycle seat or frame. PLEASE CHOOSE ONE OR TWO SIZE UP IF YOU ARE FROM U.S.A OR EU TO FIT YOU BETTER. 3D GEL PADDED: With 3D thickened protection pad, our underwear shorts can alleviate the pressure of your buttocks. The coolmax functional yarn on the surface of the pad can effectively absorb moisture and release sweat. 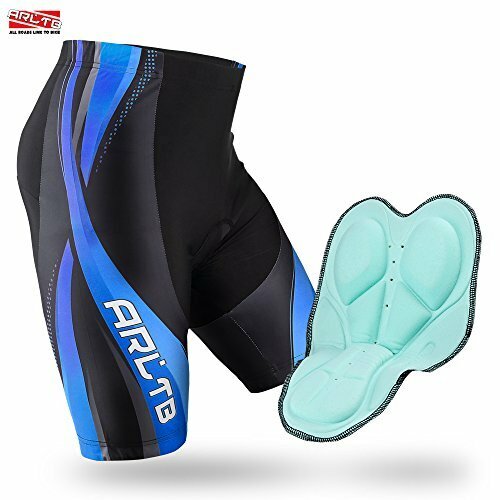 HIGH QUALITY MESH FABRIC, polyester; foam pad, our 4ucycling 3D gel padded shorts are made of high-quality mesh fabric which has fine air permeability, moisture absorption and sweat releasing properties. Therefore, it can prevent you from any discomfort such as senses of greasy, or sticky while riding and keep your skin breathing freely. What a happy riding time it provides to you. MORE SUITABLE FOR THE CONTOUR OF THE HUMAN BODY: Our shorts is more suitable for the contour of human body. SUPER SOFT ,THIN CIRCULAR DESIGN: The pad adopts a super soft design philosophy,a thin circular surrounding somewhat thick in the center,which perfectly solves the friction problem towards the inner part of thighs,freeing you from the friction sufferings during riding and letting you enjoy a happy time during the journey, it is better to have. If you're an avid cyclist and constantly experience chafing and pain from the long hours on the road, the Sportneer 3D Padded Cycling Shorts is just the solution for you. friction and doesn't cause abrasions. Made for comfort and sewn with quality, these shorts allow you to pedal with passion and ride in motion at absolute full speed ahead. Do you love cycling but find most bicycle seats are uncomfortable and cause hip pain? Do cycling underwear shorts ride up your legs, making the whole ride super uncomfortable? If you are looking for effective the solution for the best riding experience, Look no further. Notice our cleverly crafted cycling shorts , featuring exclusive fabrics & chamois technology! 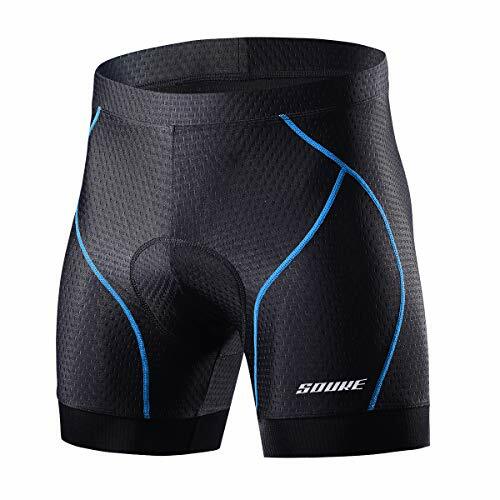 Designed to be worn under your everyday clothes, Souke Sports Men's 4D Padded cycling underwear is not only super stylish, but they are bursting with features to keep you comfortable throughout your ride. Seams are flat locked for next to skin softness. Elastic Waist Band for comfort and security. Silicone leg grippers to keep shorts in place while cycling. Soft Multi-Layer Padding for comfort on long rides. So why not start now? Enjoy a pain-free happy riding time after using our cycling underwear shorts. ANTI-SLIP LEG GRIPS: The 1.8inch width, soft and subtle silicone leg grippers eliminate slipping and chafing and keep the chamois pad in the right place, letting you enjoy a comfortable long ride. SNUG, LIKE A SECOND SKIN: Ideal for leisure rides and commuting. Our mens cycling underwear shorts are made of lightweight, breathable mesh fabric which wicks away moisture dries quickly and features 4-way stretch for absolute cloud-like comfort. ERGONOMIC 4D PAD FOR MEN: Compact, seamless chamois with 4-way stretch and 4D, 6-layer premium protective multi-density foam padding provides comfort and durability. Meanwhile, the pad is perforated for air flow and ventilation in the saddle area, making it lightweight, breathable, and help to prevent saddle sores. WIDE ELASTIC WAISTBAND: Compared with regular mountain bike padded underwear shorts, the soft, 1.4inch non-binding waistband does a great job of comfortably holding the shorts in place from the top for best performance. EXCELLENT VALUE + 100% MONEY BACK GUARANTEE Padded Bicycle Underwear is great for cycling and for multi-sports. We guarantee 100% satisfaction. If unsatisfied with the quality of the road bike underwear, we will offer a free replacement or full refund. We've designed these cycling shorts with a special 3D pad that pads your bottom to prevent friction, and anti-slip grips that keep your shorts firmly in place with softness that reduces friction and doesn't cause abrasions. Made for comfort and sewn with quality, these shorts allow you to pedal with passion and ride in motion at absolute full speed ahead. 2.5cm/0.9inch pad (compare to 2 cm/0.78inch pads of many cycling shorts in the market), for extra comfort and cushioning. Breathable material provides super flexibility and keeps your body dry. Comfortable Material The cycling underwear men are made of Polyester and Spandex, it is lightweight,breathable,and quick dry disperses sweat away from the cycling shorts;High elasticity provides extra comfort,perfect for extra long cycle rides, our bicycle padded underwear can help minimize wind resistance for your best performance! 4D Gel Hip Pad The biking padded underwear designed with an ultra durable, premium, stitched 4D silicon foam padding that won't slip or slide, for excellent resistance and comfort when used with hard, uncomfortable bicycle seats! The pad features that won't be subjected to wear-and-tear, and provides cushioning even while cycling for long distances, for full protection. Excellent Design This padded biking underwear men are designed for ultra comfortable, long lasting wear with a breathable, lightweight design, wear resistant polyester material and 4D gel foam padding! These bicycle shorts for men allow you to cycle the distance without experiencing chafing and saddle sores, for absolute cloud-like comfort. 100% Satisfaction Guaranteed Please check the size chart before ordering the mens padded cycling underwear, all orders We accept at 30 days free returns. If the size doesn't fit? No worries, all our products are fulfilled by Amazon and therefore eligible for free returns if the sizing is not what you expected. Enjoy your absolutely RISK FREE purchase for this special price today. Serves as Best Gift This bicycle underwear shorts for men is highly durable. Unlike others this biker shorts men does not irritate the skin, it is designed with skin-friendly materials. This is the best gift to give to those cyclist freak and they will so much value it. Who do want to buy it for? Hello everyone, welcome to our shop to purchase products. The last picture in the picture section of the page is a clothing size table. Due to different size standards of different clothing, please pay attention to the size table before selecting and purchasing products. In case there is any quality problem or you find the clothing unsuitable when wearing it after purchase, please contact us by email. We will reply to you within 24 hours and offer a satisfactory solution with the best service. Please feel free to purchase our products. Wish you a nice shopping and happy life. 1;According to the position of human bady sciatic to set up the pad,let yourself feel comfortable in the process of ridng. 2;Soft fabric cushionlayer reduces the friction effectively. 3;Anti-shock.3D padded which provide good protection,to avoid injuries caused by riding. 4;High quality Gel Add to sponge with 78 airholes ensures maximum anti-bacterial ability and breathability. 5;Suitable for men, our shorts can help relieve hip pain from long cycle rides. If you're looking for the perfect pair of cycling undershorts and are tired of cheap shorts that easily wear after little use, our Cycling Undershorts are the perfect choice, with 3D padding, premium, breathable material and a lightweight design! Click "Add to Cart"now! Ergonomic design, 3D cutting and advanced sewing process make it comfortable to wear on. Functional breathable, moisture absorption and sweat releasing fabrics will help maintain good breathability and efficient sweat releasing, so that you will not feel stuffy, the fabrics will not stick to your skin, and you will stay breathable, cool and dry for a long time when cycling. 4D high-density breathable Gel cushion is adopted. Its good air permeability and high elasticity and resilience of sponges will effectively relieve the hip pain or discomfort caused by cycling. Large areas of high-cost non-slip materials at the bottom of shorts will effectively prevent your shorts from moving up and down while cycling, and also reduces the likelihood of irritability caused by friction during exercise. Friendly reminder- please do not mix with light-colored polyester clothes and those with zippers or sharp rough surfaces while washing it, so as to prevent color displacement and damage, thus affecting its use. 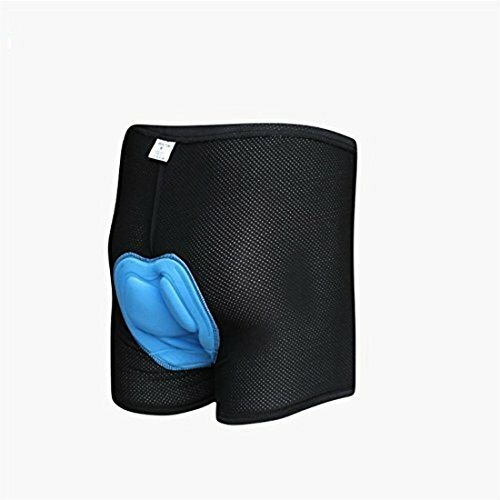 Sweat Resistant and Thick Elastic Pad - KUYOU cycling underwear quick-dry material disperses sweat away from your skin, makes you feel cool and refresh. The softness and elastic fabric minimizes wide resistance, more safety for your cycling. Bicycle shorts are not just meant to be worn by professional bicyclists, if you want to hop on a biked and ride away for health reasons or simply because you like riding bikes, you must consider wearing the right kind of clothing to protect your body from long term hurt. Cycling shorts are meant to sit on your skin and protect you so do not wear any underwear below them. Wearing an underwear underneath your cycling shorts is counter-productive as it just adds further seam lines that can cut down on blood flow and increase irritation by not absorbing sweat properly. Padding is one of the most important components of bike shorts if not the most important. Make sure that the padding is thicker towards the center, good padded shorts will be able to absorb much of the shock and reduce the stress your body is putting on the perineum as you shift your weight while pedaling. A thickened gel pad is preferable over foam if you are riding long distances as gel tends to last longer keeping its compression property intact. Cycling shorts are meant to fit you perfectly while riding, this is achieved with spandex, a material that can stretch as per your body movement when pedaling. The polyester interlaced with the spandex wicks out dampness and lets your skin respire. STYLISH SHORTS FOR CYCLISTS. Cycling shorts are not just meant to be stylish although looking cool in your gear should be an added incentive, good cycling pants are a part of necessary gear for any type of cyclist. GEL PAD ABSORB SHORCK & REDUCE STRESS. Padded bike shorts are worn to mitigate the shock our body receives continuously while riding a bike. Those cycling shorts padded with gel are able to absorb much of the shock and reduce the stress your body is putting on the perineum as you shift your weight while pedaling. BREATHABLE FABRIC TO KEEP COOL. Made of polyester and spandex fabric for maximum comfort, which can stretch as per your body movement when pedaling. The polyester interlaced with the spandex wicks out dampness and lets your skin respire, allowing blood circulation while maintaining the compression. Package: Bike Shorts x 1. Waist Size Reference: S:25 - 27.5 ; M:28 - 30.5 ; L:31 - 33.5 ; XL:33.5 - 35 ; XXL:35.5 - 38; XXXL:38.5 - 41. Four colors of Red, Blue, Green and Yellow for choice. What can X-TIGER cycling underwear bring to you? 100% Satisfaction guaranteed. We are not only selling cycling underwear but also providing excellent customer service. X-TIGER is a truly original cycling equipment brand, owned by a passionate team. X-TIGER TEAM was established on the afternoon of December 5th, 2013. Our team members met at several cycling clubs. Later we knew that we were all enthusiasts of cycling and were engaged in cycling equipment design. So everyone started the X-TIGER TEAM cycling design group and sold our own products under the common hobby and ideals. Our mission is to ensure top-quality ,and have won unanimous praise of the cycling enthusiasts with superb quality. As professional cycling brand, X-TIGER offers a wide selection of cycling sports life including cycling apparel, protective gear, helmets and cycling accessories at high quality yet low price because we are also the manufacturer.We believe that we know the most about cycling and we believe that our products will not disappoint everyone. Choose X-TIGER and choose your ride life. 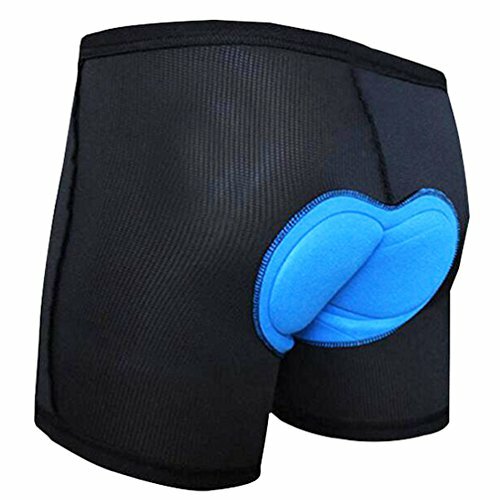 BRAND 5D PADDED BICYCLE SHORTS -Tired of cheap,bulky cycling shorts that easily wear after little use?Specially designed with shaped as your bike seat and stitched 5D thickened padded, which can protect friction between hip and your bike seat, fit more tightly,relieving hip pain during the long riding. COMFORTABLE FOR LONG DISTANCES -These padded bike shorts allow you to cycle the distance without experiencing chafing and saddle sores, for absolute cloud-like comfort. BREATHABLE & LIGHTWEIGHT -Designed with 87% polyester and 13% spandex, these bike shorts are flexible, tear-resistant with breathability for an enjoyable ride ahead. SWEAT RESISTANT -Our premium breathable polyester material easily and quickly absorbs and releases sweat from the skin, for comfortable wear during the longest cycle rides, and can be easily worn under everyday clothes! Excellent After Sales Service -100% Satisfaction guaranteed. We are not only selling Cycling products but also providing excellent customer service. PLEASE NOTE:If you have any problem with the produce, just let us know, we will try our best to SOLVE it for you until you are SATISFIED! --- DESIGN! If you tired of your Underwear with a boring designs, our company can help you to ADD SOME VARIOUS anything you want in your life. you can GIVE ME A PICTURE and you will Enjoy the cute design and unordinary prints of this Boxer Briefs. --- DELICATE! You own it or give someone as GIFT,the Boxer Briefs will surprise who you want to be surprised. 1. Please check the size details about this men underwear carefully before you purchase. 2. Please allow litter size difference of Underwear because of the manual measurement. Q:Can I custom made and order my own underwear? A:Yes,you just send me a photo you like,and I will give you a beautiful underwear that you want. A:It is Polyester and Spandex. Comfy to wear. Q:Is the size standard?How do I confirm the size? A:Please choosing suitable size according to the size table we provided (Picture Shows).You will find the one suitable for you. Better Material:The Boxer Briefs is Made of Polyester and Spandex,Soft Breathable and Confortable. Optional Size: There are 4 Different Sizes about Breathable Underwear. the Brief will Fitted You Whatever on Vacation or Go to the Beach. Please choosing suitable size according to the Size Chart we provided. Fashion Design:The Design of Underwear is Concave and Convex Space Capsule. DIY Custom Made: You Can Sent me a HD Picture,and I will give you the Boys Underwear what the Picture shows.It's a Personalized Gift. Warranty: The Product will Normally Reach You in 8-15 days express delivery 4-7days .If You are not Happy with Your Shopping,just Tell us,We will Solve Your Problem at the first time. 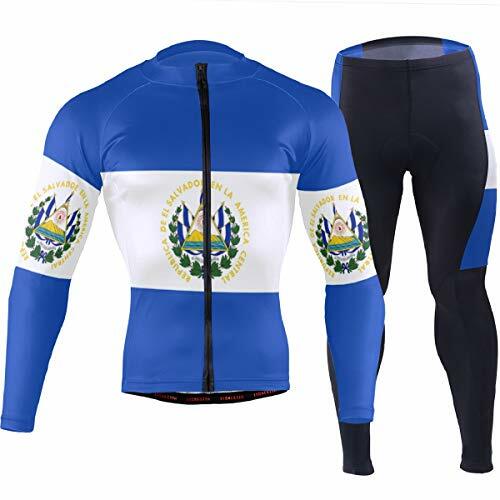 Are you looking for high-quality bike jersey, pants and suit ? -High-quality non-slip silicone band on the waist, thighs and ankles. Non-slip Silicone Band High-quality non-slip silicone band on the waist, thighs and ankles. Sun Protection Ideal for cooler days, but still very comfortable to wear in summer. Versatile premium fabric breathes very well in hot days. Long sleeved can protect you from sun burns. High-Wicking Made with advanced breathing versatile premium fabrics, maximums the ventilation and provides effective moisture wicking ability, to provide the highest level of comfort and durability for all types of athletes. Lightweight But Durabl Lightweight material with good workmanship and stitching, guarantee the daily use. Suitable for kinds of outdoor sports. Easy Care and Easy Wear Vibrant Dye-Sublimation Durable non-toxic printing keeps colors bright and true after wash and wash. 12 front zipper is easy to wear. Three convenient REAR POCKETS (6.9in depth with elastic closures) for storing essential gears,water bottles and other personal items. Elastic hem keeps rear of jersey in place as you ride.